The owner of this beautiful house on the hill recently slipped down these steps and narrowly escaped serious injury. We applied a new finish with an anti-slip texture to prevent this from happening again. The latest minimalist styles in décor and design have led to many modern homes and commercial buildings being constructed or refurbished with concrete / cement finished floors. Simply painting the floors may work indoors but with the harsh South African sun a stronger and more durable product is required outdoors. 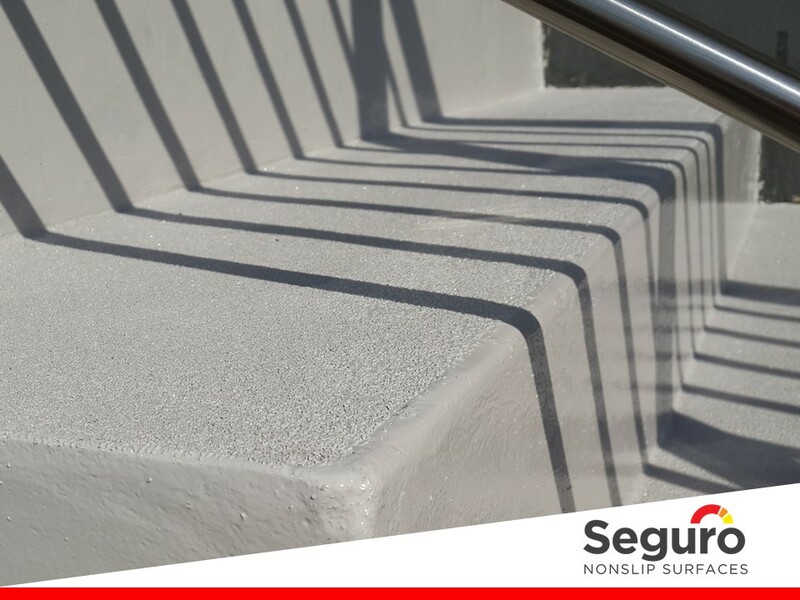 Adding the requirement to prevent slips and falls on smooth slippery areas makes Seguro’s textured floor coatings the ideal solution. These coatings are available in any colour to match the design of your home or office. The textured coating cures to a glossy durable finish with UV protection to ensure that the colour does not fade. Ideal for indoor and outdoor surfaces.